Annals Of Weight-Loss Gimmicks: From Bile Beans To Obesity Soap : Shots - Health News People have been worrying about their weight far longer than you might have imagined. A recent event highlighted some fads through the ages, but it also revealed a diet from the 1860s that seemed to work. 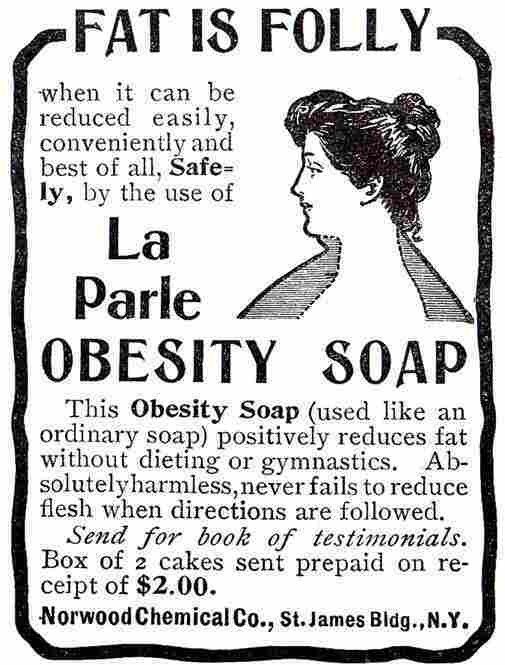 An ad for La Parle Obesity Soap from 1903. The soap cost a dollar a bar. 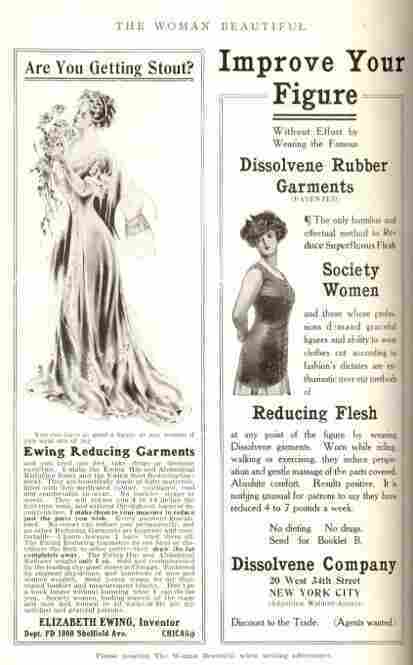 A page of ads inside The Woman Beautiful magazine issue from June 1908. 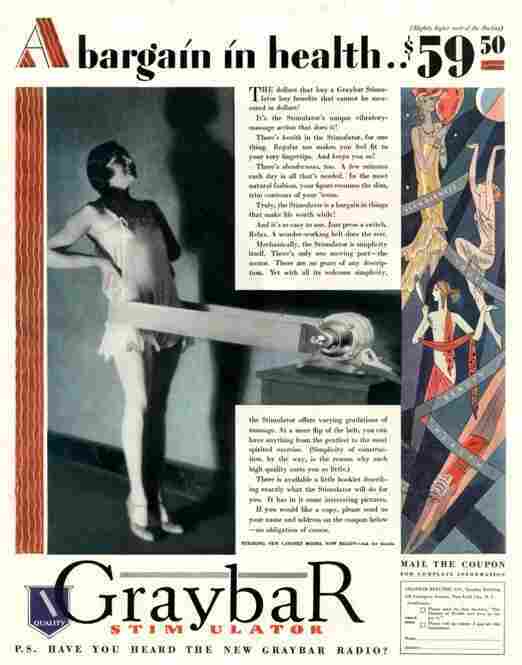 The Graybar Stimulator, an exercise machine, sold for $59.50 in the1920s. 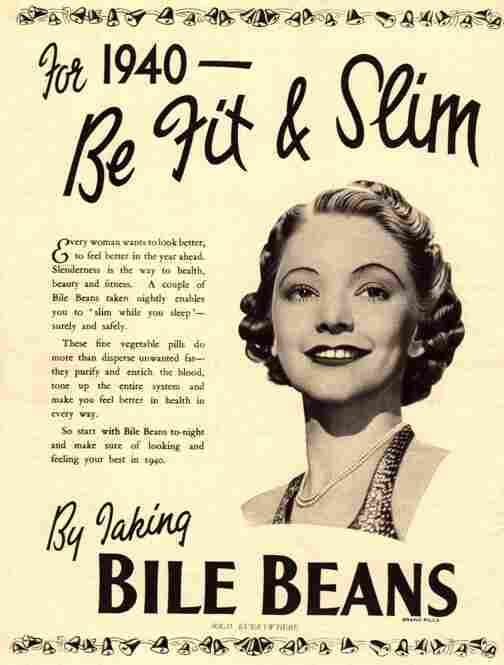 An ad for Bile Beans, a remedy for all sorts of female complaints, contained aloin, an aloe extract with laxative properties that is no longer considered safe. Other ingredients included peppermint oil, cardamom and wheat flour. When diets fail, there is always underwear. 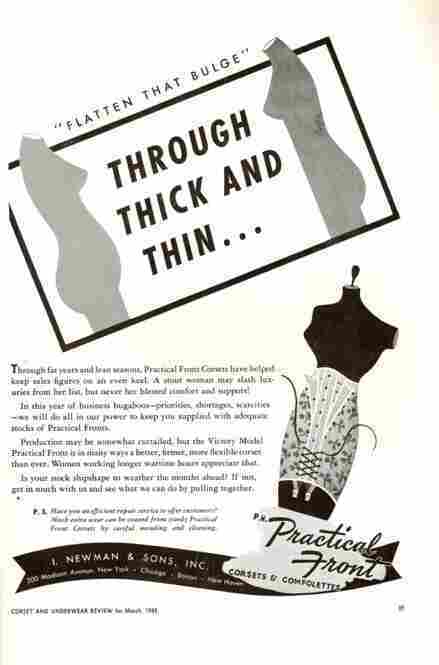 An ad from Corset and Underwear Review, March 1943. 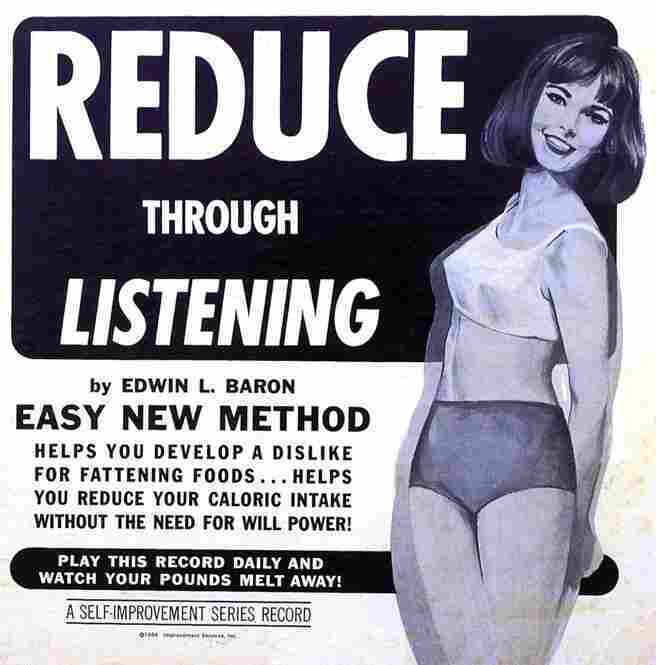 A 1964 ad for a self-improvement record series promotes a psychological approach to losing weight. Mostly for the exercise, I ambled over to the Library of Congress Wednesday for a panel discussion on obesity and weight loss in modern times. The event was sponsored by Weight Watchers, and a couple of the company's people spoke, but some of the most interesting bits seemed to me to be the historical perspectives on weight and weight loss. For starters, take a look the slideshow we put together of some nutty approaches to losing weight — or concealing that you haven't. Poster-size copies of many of the images were featured at the Library of Congress. From Bile Beans, which promised to "disperse unwanted fat" and "purify and enrich the blood," to a record that was supposed to train you to dislike fattening food. As the ads attest and Clemson University sociologist Ellen Granberg said in a presentation, "Interest in dieting and concerns about weight" surfaced a lot earlier than many of us ever would have imagined. Early in the 20th century, the rise of labor-saving devices, advances in nutrition and a lessening of risks from infectious disease combined to influence people's views on weight and diet, she said. It was a lot easier to be plump, but it wasn't seen as desirable. The library also put on display a bunch of diet books, including one popular in the 1860s. A brisk seller in its day, the Letter On Corpulence, Addressed To The Public by Englishman William Banting offers his first-hand advice for losing weight. Way back in August 1862, the 5-foot-5-inch Banting weighed 202 pounds. 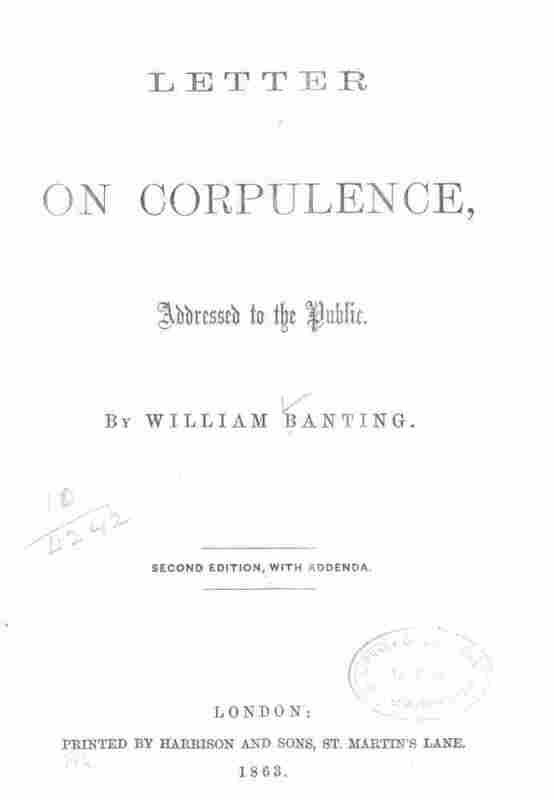 A retired businessman, Banting had been overweight for quite a while and had tried various remedies of the day. He eventually settled on a daily menu that bears some resemblance to the high-protein, low-carb diets many people favor today. He drank a lot more than the modern diets allow, though. Even then he shunned beer for wine. After recounting approaches that failed him, he provides a diet plan, starting on page 18, that finally did the trick. After a little more than a year, he dropped 46 pounds. And his regimen even included a nightcap! For dinner, Five or six ounces of any fish except salmon, any meat except pork, any vegetable except potato, one ounce of dry toast, fruit out of a pudding, any kind of poultry or game, and two or three glasses of good claret, sherry, or Madeira — Champagne, Port and Beer forbidden. For tea, Two or three ounces of fruit, a rusk or two, and a cup of tea without milli or sugar. For supper, Three or four ounces of meat or fish, similar to dinner, with a glass or two of claret. For nightcap, if required, A tumbler of grog — (gin, whisky, or brandy, without sugar) — or a glass or two of claret or sherry.